Refectocil Eyelash Curl with collegen and cysteine gives your lashes a wonderful curl, letting the eyes appear larger and more expressive. At the same time the eyelashes are nourished. Unlike mechanical lash curlers Refectocil Eyelash Curl gently forms the eyelashes with the curl lasting up to 6 weeks. Collegen is one of the commonly occurring structural proteins in the human body. Together with the amino acid cysteine, proved to contribute to hair development, these active ingredients nourish and protect the eyelashes during treatment, allowing them to appear groomed and fuller. The application is simple, safe and takes about 15 minutes. With the choice of 4 different roller sizes you can achieve the perfect eyelash curvature for each customer - independent of eyelash length or eyelash form. 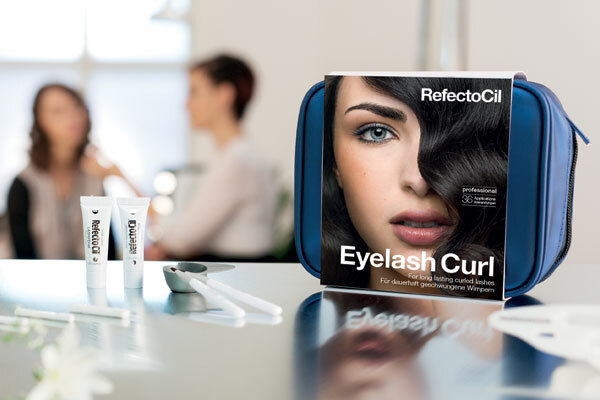 Refectocil Eyelash Curl provides a service in your salon that your clients will be enthusiastic about. First you create the eyelash curl with Refectocil Eyelash Curl. Then you tint the eyelashes with Refectocil Eyelash and Eyebrow Tint. Note: After using the Refectocil Eyelash Curl the application time of the Refectocil Eyelash Tint is reduced to only 2 minutes. To complete apply Refectocil Longlash Gel for optimum care of curled and tinted lashes. Used daily it intensively strengthens and nourishes lashes giving them a wonderful shine. ALLERGY TEST: Before starting the treatment perform an allergy test. With a cotton swab apply a small amount of both lotions to the inside of the elbow or behind the ear. Let it dry and don't wash or cover the area for 24 hours. If skin irritations appear do not use the Eyelash Curl. First remove any contact lenses. Cleanse the eye area with Refectocil Eye Make Up Remover. For optimum adhesion of the eyelash rollers, remove all oils from the eyelids and eyelashes with Refectocil Saline Solution. Then pat dry with a cosmetic cloth. Before starting the treatment briefly brush the eyelashes to separate them. HINT: To simplify the process you can cover the lower eyelashes with Refectocil Silicone Pads available separately. That way you assure that you affix only the upper eyelashes to the eyelash rollers. The shorter the eyelashes and the more curl the customer desires, the smaller the roller you select. You have selected the correct roller size when the eyelashes cover half of the roller circumference. If the chosen roller is too small and the eyelashes too long the result will be a u-shaped curvature. If the chosen roller is too large and the eyelashes too short the result is no curl or a weak curvature. Remove a self-adhesive eyelash roller from the foil. Only touch the ends of the roller so it does not loose its adhesive quality. By bending the roller several times the eyelash roller will achieve a form corresponding to the lid curvature. If the eyelash roller is too long and extends beyond the lid edge you can trim with scissors. From now on the client has to keep the eyes closed until the end of the treatment. If necessary - gently stretch the eye lid with your fingers, first apply the eyelash roller at the inner lid edge - just above the base of eyelash. Apply the other end of the eyelash roller at the outer lid edge, affix the roller with light pressure along the eye lid. Using the application stick, affix the upper eyelashes to the eyelash roller starting at the inner lid edge. With a winding upwards motion press the eyelashes evenly and straight onto the self-adhesive eyelash roller. Should the individual eyelashes adhere crossed over on the eyelash roller, carefully remove them and affix them in a straight line. With stubborn eyelashes or those that have come off apply a small amount of Refectocil Glue to the eyelash roller and affix the eyelashes again. After all eyelashes adhere perfectly straight to the eyelash roller ask the client to briefly open the eyes. Then you can see if any eyelashes from the lower lid adhere to the eyelash roller. If so, carefully remove them using the application stick, as only the upper eyelashes are being curled. Squeeze a pea-size amount of Refectocil Lash Curl Solution 1 into the Refectocil Cosmetic Dish 1. Using the Refectocil Cosmetic Brush 1 generously apply a strip of Lash Curl Solution 1 to the centre section of the eyelashes where the curl is required (do not apply at the base or the tips of the eyelashes).. Please Note: Depending on the eyelash structure the application time can be increased by 5 minutes (thick eyelashes) or reduced (fine eyelashes). Squeeze a pea-size amount of Refectocil Neutraliser 2 into the Refectocil Cosmetics Dish 2. Using the Refectocil Cosmetic Brush 2 generously apply a strip of Neutraliser 2 to the same location as the Lash Curl Solution 1. At the end of the application time remove Refectocil Neutraliser 2 with a dry cotton swab. Touch the eyelash roller several times with a moist cotton pad. The moisture slowly loosens the glue. If necessary, gently rub back and forth several times until the glue is totally dissolved. Gently stretch the eyelid and carefully roll the eyelash roller downward. Dry the eye area with a cosmetic cloth. If the curve of the eyelashes is too strong, the selected eyelash roller was too small. 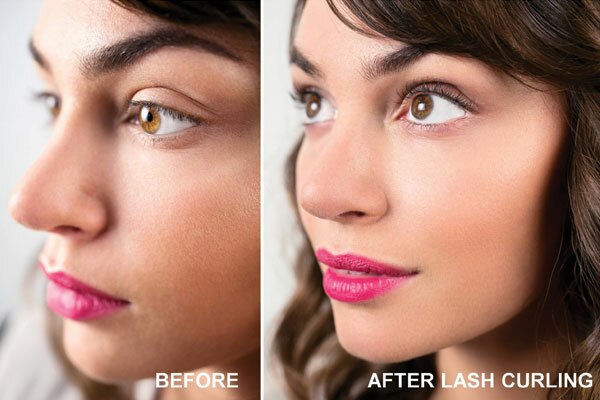 Select a larger eyelash roller and repeat the process using half the application time. If the curve of the eyelashes is too weak reasons could be: application time too short (with Lash Curl Solution or Neutraliser), the roller too large, or eyelashes not cleansed correctly. An uneven result can occur when Lash Curl Solution or Neutraliser are applied unevenly, the eyelash roller not positioned correctly or the eyelashes were not attached straight to the eyelash roller. It is recommended to tint the eyelashes with Refectocil Eyebrow and Eyelash tint. Applied directly after the eyelash curl a reduced application time of just 2 minutes applies (for thick/strong lashes 5 -10 minutes). Providing amazing, looking lashes. To complete this service apply Refectocil Styling Gel. To groom, nourish and leave beautiful, shiny healthy lashes. The final result for your client: the most beautiful eyelashes. With curvature, intensified colour and a beautiful shine, lasting up to 6 weeks. Lash Curl Solution, Neutraliser: 10.5ml. Best used before the end of (MMYY): see tube fold. After opening 2 months. Always close the tube immediately after use. Glue: 4ml. Best used before the end of (MMYY): see container. After opening minimum: 3 months. Shake before using. Always close the container immediately after use. Store products in cool and dark place. Always clean cosmetic brushes and cosmetic dishes immediately after use with Refectocil Saline Solution. ATTENTION: For professional use only. Follow instructions. Avoid contact with eyes. In event of contact with the eyes rinse immediately with plenty of water and seek medical advice. Wear suitable gloves. Keep out of reach of children. Lash Curl Solution contains thioglycolate. Neutraliser contains Hydrogen peroxide. The emolsion has been optimised. Previously it contained components that reduced the durability which led to a longer application time. These components have been eliminated. The ingredients have been improved and harmonised. The pH value has also been slightly changed. Therefore the application time has been reduced whilst still being gentle and nuturing to the lashes. The formula meets all the requirements of the EU cosmetics regulation.